Golden Sands Hotel Apartments, part of A.A. Al Moosa Enterprises and pioneered the concept of hotel apartments in the region, is pleased to announce the launch of its redesigned website www.goldensandsdubai.com. Featuring an upgraded design, innovative booking engine, with colourful and vibrant photos of the property and its facilities including images of the many attractions in the city, the new look and feel of the website will give anyone landing on the site the true reflection of what awaits them. The fresh platform allows users to book rooms by individual unit or by category and checks availability with just a few clicks. Viewers can see special promotions, book and receives immediate confirmation. The user-friendly website can be accessed using your desktop, laptop, tablet or even mobile phone. “The site is fully mobile responsive and offers an easy and user friendly online booking system for both leisure and business travellers. We invite you to visit the site to get a feel of your “home away from home” destination,” added Khoori. The attractive new website features more search functions and features that will be of great assistance when planning for holidays, short vacations, meetings or attending conventions. It also allows travellers to check Golden Sands Hotel Apartments social media platforms such as Facebook, Twitter, Instagram and YouTube. 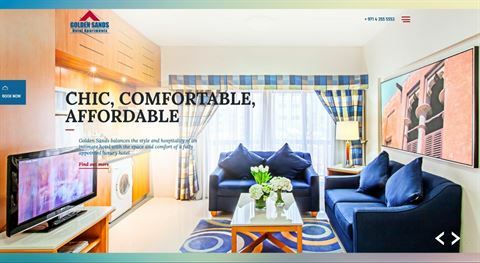 Explore Golden Sands Hotel Apartments website at www.goldensandsdubai.com.